Death, despair, hatred, fear and revenge. The most devastating effects of war. Ninjas fought for glory and for land in the harsh times of the warring clans Era. Through many countless battles and many more countless losses the clans had began to settle. Diayamo's began to sense the coming the end to the long 200 year period. With the wars coming to an end the Diayamo's gathered, one from each region. Storm, hailing from the mountains of the northeast. Heat, coming from the lush forests of the centrel and south. Lastly Frost coming from the frozen over tundra to the east and all of the islands behind it. They gathered and discussed plans on how to end the fighting. In they end they made thier decision to create villages to home and hone the skills of these clans. With that the 200 years of war had ended but now began a new era of fighting. The Era of the Hidden Villages. The Diayamo of the storm, Kenji Urachi, went to the most powerful clans in his territory. The fearsome Yotsuki and devastating Kaguya. Legends had spread even to the Diayamo's ears of these 2 great clans. The leader of the Yotsuki, Meiji, was a strong user of lightning chakara. He was dubbed the most fearsome lightning user of his time. He lead his Yotsuki acroos the land of Storms and dispatched every clan that stood in their way. With this they put their dominance at the top. The Kaguya who had traveled all the way from Frost country allied themselves with the Yotsuki. Devashi Kaguya was the leader of them at the time. He and Meiji were distant cousins. It was with their combined might that they secured a name forthemselves for countless generations to come. Devashi Kaguya was already a master of Taijutsu but with his Kekkei Genkai he exceeded his limitations and become the strongest Taijutsu user of his Era. Once the 2 had teamed up they had made their plans and actions clear as day. They were gonna exterminate the Uchiha of Heat Country. The leader at the time, Skye Heero Uchiha. No one was ready for the battles that insued. Skye heero who at first did not want to fight the alliance had raised his clan to battle them. The fued lasted for 2 years, the longest battle in this war time era. In the end Meiji had killed Skye and taken control of the Uchiha clan. 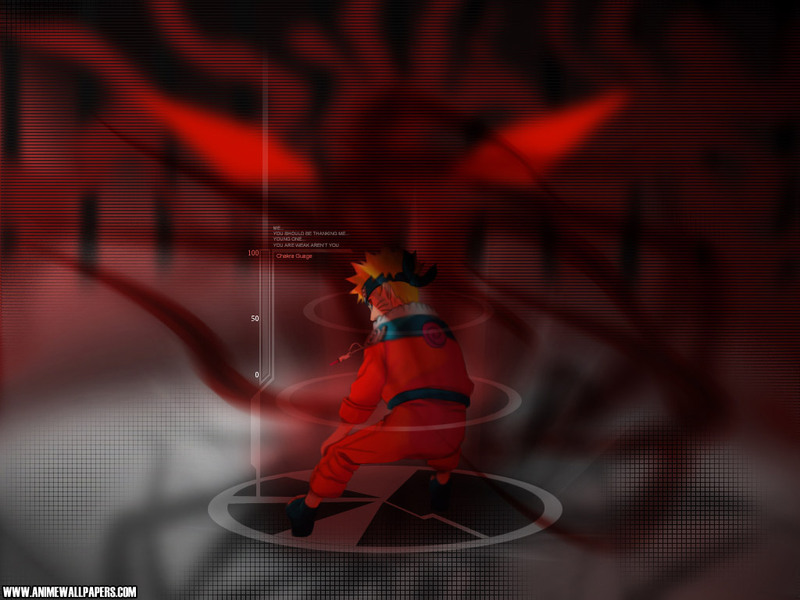 Although the stuborness of the uchiha wouldnt allow them to be taken so easily. Meiji was not afraid to supress the uchiha the, few that survived were the ones who swore ultimate alliance to both Meiji and Devashi. Together the 2 clans roamed the storm. The Diayamo had approached the 2 clan heads promising them each a land of their own to rule if they would serve the Diayamo. The 2 warriors agreed, both respecting Kenji for his battle prowess, as such The village hidden in the Lava, Yogangakure, and The village hidden in the Tornado, Tatsumakigakure were created. It was Meiji who would be the first Yokage and Devashi who would be the Tatsukage. The Diayamo of the frost Hiki, ice princess, was arrogant and believed that no one would be able to breach her ice castle. She was against the plan for the villages and didnt immediatly look into creating them. Kenji knew this and propositioned Meiji to send in infaltry unit to go and attack her. Meiji agreed to the request and sent his only child, a femal Komuri, to do the job. Though she was 17 at the time she had great skill and strength. Hiki didnt see the attack coming and that night she was supposed to be assasinated. This however was a trick. Instead the young Komuri Yotsuki was captured and imprisoned. Through this she learned of the threats of villages and those who controlled them. She immediately set out on finding a clan that would make a strong village. She found the Yuki clan and the Hyuuga clan. The Yuki clan who were well known for their ice Kekkei Genkai were the first to be intrusted with running a Village. The few ice clans that roamed the area came together under the leadership of Hiori Yuki. Thus The village hidden the ice was created, Korigakure. Hiori Yuki was named Korikage. Shortly after finding the Yuki clan she came across the Hyuuga clan and their famous Kekkei Genkai, The Byakugan. She initially thought of winning over this clan in hopes of counteracting the Uchiha clans Sharingan. The leader of the Hyuuga who was Jin Hyuuga a powerful Byakugan master. The village hidden in the Hail was created and Jin Hyuuga was named Hyokage. The Heat country was the second country to assemble its villages. The Diayamo Hanz Kyoku traveled the heat every inch searching for a powerful retainer. Someone both as loyal as Meiji and just as strong as Devashi. He had found the ideal soldier in Nagahio Uzumaki. The perfect combatanant against both Meiji and Devashi. Nagahio simpathized with Hanz and his views on the land. Hanz who believed that the world would be peaceful again and the land would remain calm. Nagahio agreed with this and thus their partnership was born. Nagahio gathered with the senju and founded The village hidden in the Forest, Morigakure. Nagahio was deemed Morikage. It was said that on Meiji's march through Heat country he was halted by Nagahio. The 2 had a quick fight but in the end Meiji retreated back to the storm. Hanz had found an excellent underling and was out to find another when he ran into Hachi Aburame. The tales of the Aburame spread far and wide. They had clashed with the Hyuuga on several occasions during the war torn Era. Hachi was approached by the Diaymo several times but always declined his request. It wasnt until he had ran into and later on fought against Devashi until he realized that the Storm had grown to strong. He agreed to Hanz's demands and joined him and Nagahio. The Village hidden in the Earth, Jigakure, was founded. Hachi was named Jikage. 10 Years have passed since the founding of the villages. The leaders remain in power and each village has begun to build up their ninja abilities. But for some reason there is unrest in the land. A battle begins. A 3 way power struggle as ninja from every village gather and fight to the death. Some fought for power, others fought for respect and some fought for Revenge. Meiji was out for blood after hearing about the sitiution of his daughter. He had gathered his allies and began a march towards Frost country. Hiki who had already forseen the attack pushed for Kori and Hyo to strike against Meiji. Fearing for the destruction of their homeland, Nagahio and Hachi teamed up together to stop the march. A huge battle ensued and the first great ninja war was born. Amidst all the Chaos, Death and Destruction a huge earthquake began to rumble underground. 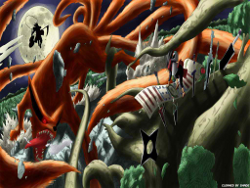 Beneath them the sleeping Bijuu of the land had awoken and the 9 tailed-beasts were freed. The separate villages retreated back to their home lands to recover. Though the war still rages on. How will the awakening Bijuu effect the world as it is? Will new Shinobi rise up to end the fighting and the war? You decide the fate of the ninja world! The warzone packed with death and destruction. The first battle since the break has been launched. Ninja clash in the land of Heat, Morigakure ninjas versus Yogangakure and Tatsumakigakure ninjas. Meiji Yotsuki pushes his troops to the front lines of the Forest of Death. His goal is to push through Heat territory and fight to Frost country. He faces many terrible disasters his people arent used to. But he has allies, Tatsumakigakure who ninjas traveled from the frost country to the storm country in the years ago. With this Meiji has hopes of getting through and continuing his advances. But a ninja stands in his way. The Morikage, Nagahio Uzumaki. This powerful warrior is hell bent on stopping his advances. He doesnt want the fight on his lands. He contiues to try and hold him back. Meiji sensing the dangerous of moving through heat sends a small envoy to seek out and find Morigakure. He wishes to launch an all out strike and take down the village. Nagahio though is a smart man employing the powers of his poeple to keep the village the best hidden secret in all of Heat territory. Mean while in the frost Hiki prepares Hyogakure and Korigakure for war. Fearing the eminance of Meiji's approach, she forces the soldies to the borders to keep patrol for the day that he arrives. Fear grows within her and she sends a small squadron of Ninja to Heat country. They are to lay low and keep tabs on Meiji's progression. But deep deep deep inside the darkness of frost country an Evil larger then anything before is about to rise and turn the tide of the war. 7 very deadly and very capable ninja bounded by their own hatred pull together in attempts to not only put an end to the war but to also bring forth a new world era. A new era of chaos and destruction. How will the ninja world react to this onslaught? How will they counter this new threat? You decide the fate of the Ninja world! The battle in the West Forest Of Death left both Storm country and Heat country completely devistated. With the defeat of Meiji and Devashi in the "Catalyst Crater", the storm country ninja retreated until they were strong enough to fight. Sensing the weakened ninja on both sides, Hiki decides to launch an all out strike against both territories. With ninja already stationed all over Heat country she orders that an elite squadron be sent to attack both sides. From Hyogakure, the Hyokage Jin Hyuuga, sends his elite task force, The Dark Order, in full assualt to attack the retreating storm country ninja. They trailed the ninja until they set up camp near the Lava Ruins. It is there that a great battle will be waged to decide the fate of Yogangakure and Tatsumakigakure. Meanwhile Hiki consults her brother, Hiori Yuki the Korigakure, to create a war plan to wage an attack against Morigakure. The Korikage then passes the task on to his daughter, Minai Yuki, a prominent ice release user and very skilled ninja. She is the Commander of the Frost Defense force and the ninja that captured Komuri Yotsuki. Setting up a battle plan she marches with top members of the Frost Defesne force to attack Morigakure while they are still injured from the past battle. What will the outcome be? How will the shinobi handle this fight? You decide the fate of the Shinobi world!